My First Little Place: Comments reactivated! I want to thank everyone for their kind emails of support and feedback on my blog, I really appreciate hearing from all of you. My dear friend Britt highlighted her disappointment (lovingly) that I don't have comments on my blog. I deactiactivated my comments when I started as I was receiving the emails. But just for her :) I have reactivated my comments. Please leave me comments as I love to hear what people have to say - good and not so good. 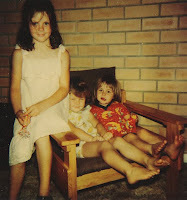 And as a acknowledgement to her I had to post this photo of us and my sister, Bec as little ones!!! hahaha this photo cracks me up but it is just oh-so cute. Look how little we were!